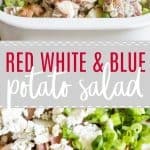 Red White and Blue Potato Salad. 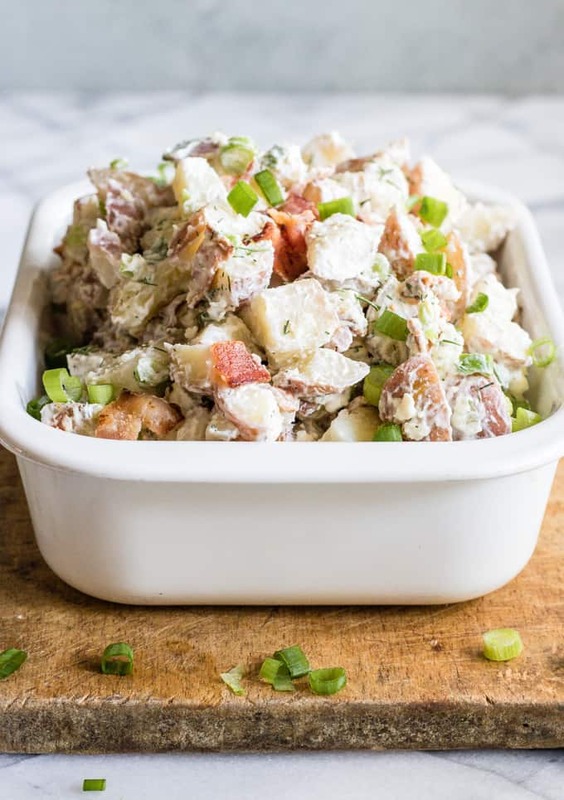 The BEST potato salad loaded up with blue cheese, bacon and green onion. Made with baby red potatoes. This flavorful salad will be your new favorite side dish for Summer BBQs! 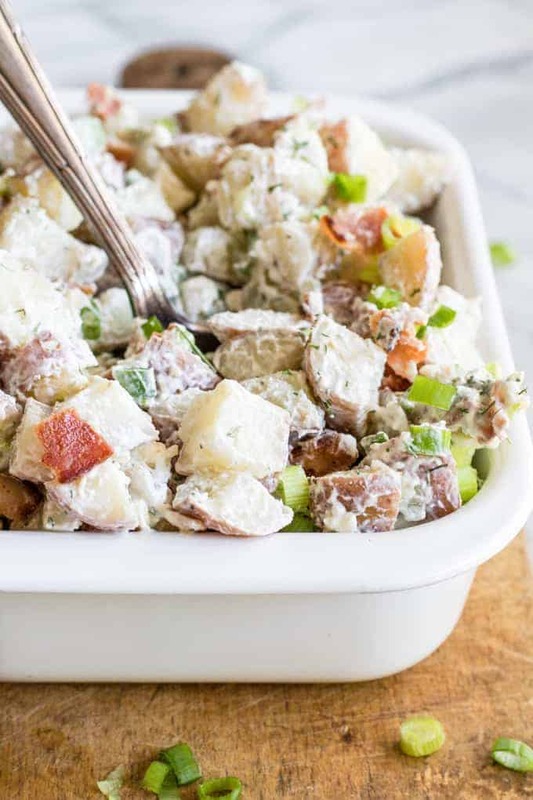 This potato salad gets it’s name from the colors of the ingredients used! Red baby potatoes. Blue Cheese. 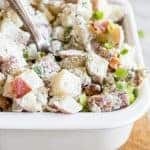 And the white sauce used to mix in with the potatoes which makes this potato salad extra creamy, flavorful, and possibly the BEST potato salad ever. To make this Red White and Blue potato salad we start with the baby red potatoes. No need to peel them. Dice the potatoes into 1/2 inch size pieces. This helps them to cook quicker. Bring a pot of water to boil and add the diced potatoes. Don’t forget the salt! 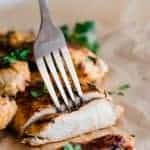 Once the potatoes are tender, and easily mashed with a fork then you can strain the water out, spoon the potatoes into a large bowl and place them in the refrigerator to cool down. When the potatoes are cooled then we can add the other ingredients. Some crumbled bacon, diced green onions, and blue cheese crumbles. We will prepare the creamy white sauce in a separate bowl. This keeps us from doing too much mixing and mashing the potatoes too much. This lets you control how mashed up you want it to be. I prefer chunks of potato personally. But I know some people prefer more of a mashed up consistency. To achieve that you can just stir the potatoes up a bit more and you will get there. The cream sauce is made out of mayonnaise, sour cream, dried dill, ground mustard, onion powder, and a bit of salt. The perfect amount of seasoning! 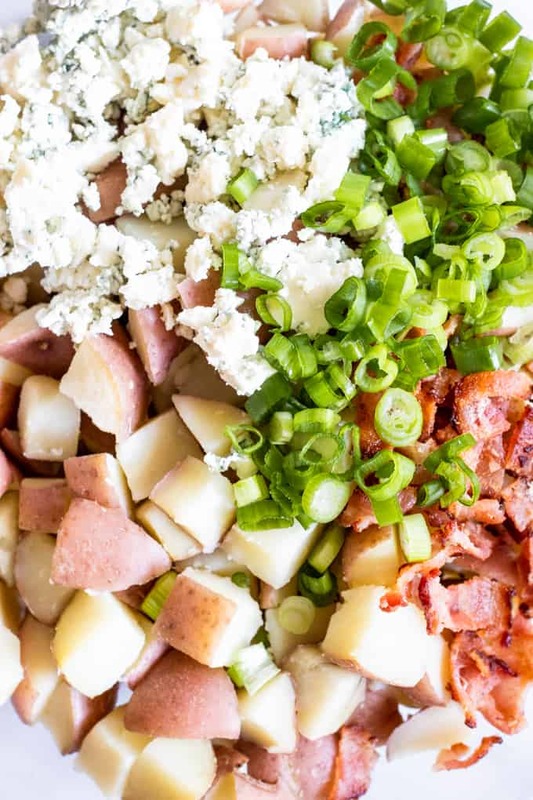 WANT TO TRY THIS RED WHITE AND BLUE POTATO SALAD? 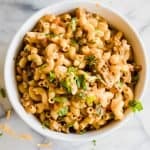 PIN IT TO YOUR SIDE DISH OR PARTY BOARD TO SAVE FOR LATER! Bring a large pot of water to boil over medium heat. Chop the baby red potatoes into small 1 inch cubes, place into the boiling water, add in the course sea salt. Boil for approximately 15-20 minutes, or until the potatoes are soft and tender and able to be mashed with a fork. Remove the pot from the heat and pour the potatoes into a strainer to drain out all the water. Place potatoes into a large bowl and allow to cool to room temperature, or place into the refrigerator to cool down. Once cooled add the bacon, cheese, and green onion. 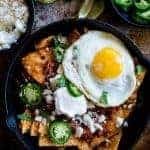 In a small bowl combine the mayonnaise, sour cream, dill, salt, ground mustard, and onion powder. Stir to combine. Add to the potatoes and stir until completely coated. Can be stored in refrigerator in a sealed container, may need to add more mayonnaise mixture to the salad as it will soak into the potatoes over time. 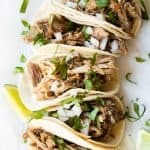 The mayo definitely counts as white! And darn delicious too 🙂 I adore potato salad, it’s my favorite part of grilling season. Love the blue cheese! Pinned! PS again, congrats on the sweet little guy of yours! Hi Serene….! 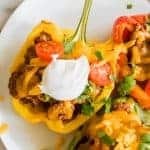 oh wow this is perfect salad for this hot summer, this looks sooo yummy & delicious… i will tried to making this potato salad…Thanks for sharing…..! This sounds fabulous, Serene. Blue cheese in potato salad.. never tried it! Will do now!